Those were the exact words I heard in my head as we came down off the long lateral glacial moraine that led from Gorak Shep to Everest Base Camp. It felt as if you were entering the domain of a living being. To hobble over the innumerable glacial rocks and enter this world of constantly flowing, intermixed rock and ice, I could feel the power that this mountain holds. The Sherpas believe that the mother goddess lives on Everest. At that moment I believed it. It felt so obvious that if you showed any disrespect she would reach out and swallow you up. And yet amidst this, Base Camp had the optimistic air of a small pioneering town. Brightly colored tents made little settlements along the edge of the Khumbu Ice Fall for a good half-mile. Each camp seemed to have a flag hanging above and a sign stating who was there. The place had an energy of expectation and excitement. You knew that a good number of the people in this camp would have a lifelong dream of climbing Everest come true within the next couple weeks, but you also knew that not all of them would be coming back. Every year there are deaths on the mountain (so far this year there have been 2). I had to wonder if it was worth it. At one time I thought I would want to be in one of those tents, full of excitement and anticipation, but not now. To stand at the foot of the top of the world and marvel, that was enough for me. 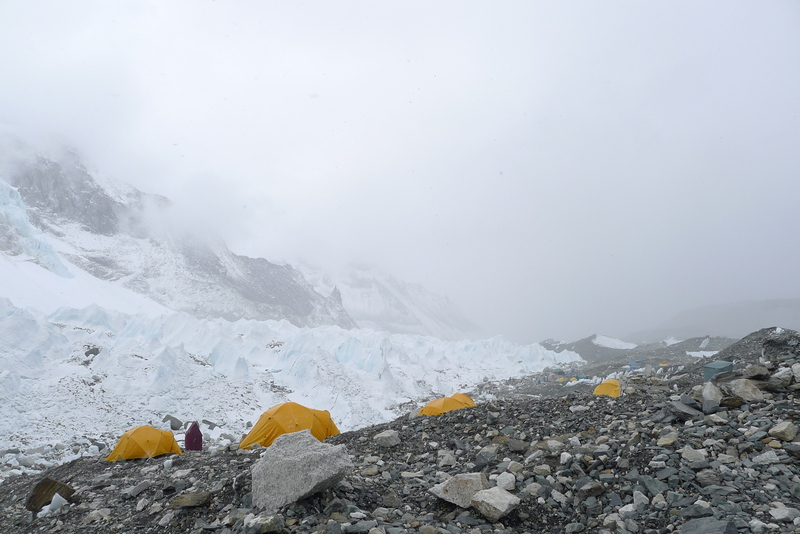 Tents strewn along the Khumbu Glacier at Everest Base Camp.